When my son was about three I brought him to the dentist. As Dr. Nancy was examining his teeth she exclaimed, “Everything looks good except he has unusual stains for his age. I know you aren’t giving him red wine to drink, (Though my Italian grandparents would not have had any objections to that.) but tell me what does he eat that is red and not common for a 3 year old.... I thought hard, “Beets” he loves beets. I always thought beets made sense to give to toddlers. They are sweet, easy to chew and incredibly healthy. Enough said... you get the point, we are beet eating family, and Dorie’s lime and honey beet salad was a hit. We loved the zestiness of the lime and the buckwheat honey we used really off set the earthiness of the beets. My only criticism of the recipe was that I think it wasn’t enough dressing for a pound of beets. Doubling it I thought was the perfect amount of coverage. I also boiled the beets because I figured that steaming hot beets would be best for absorbing the vinaigrette, and I wasn’t disappointed. Salad looks colourful..adding lime juice gives nice kick to a salad.. Yes, a lot of interesting flavors in this salad. That looks delicious, healthy & colorful salad! I've never heard of buckwheat honey, but I'm going to look for it at the store. Cute story about your son! I liked these too. I had never heard of it either, I was more focused on finding local honey because of allergies and it happen to be buckwheat. Jora, just tried the buckwheat honey in my tea... didn't taste good, not very versatile. What a cute story. I wish I had had fresh beets while growing up, but we usually ate canned and while I didn't hate them I didn't love them either so I have never made them myself until last night. Boy, have I been missing out and so has my family. This is a great recipe and one that I will be making often. I gave my son jarred a lot... he actually likes pickled beets the most...but I agree this was a nice salad. One lovely looking salad - it is nice to read that you and your family really like eating beets, we do too and we liked this recipe. I can remember when my son was a toddler and the doctor told us we were feeding him too many carrots because he was starting to turn orange! I ended up doubling the dressing recipe too, because I thought it would be a little dry. LOL, yes my son's skin turned orange from eating too much squash and carrots.. he loved any vegetable that wasn't green. Still the same way today. I came from a beet eating family as well and remember my mom worrying about stains! How funny to just now remember that! lol. Maybe she was worried people would think she was giving wine to drink? Happy that you enjoyed the salad. I did too. Your photo looks terrific. Yeah, but she likes lentils... what a great food for a kid to like. I loved this salad also. Although my teeth aren't stained red (I just looked), I eat beets a lot. 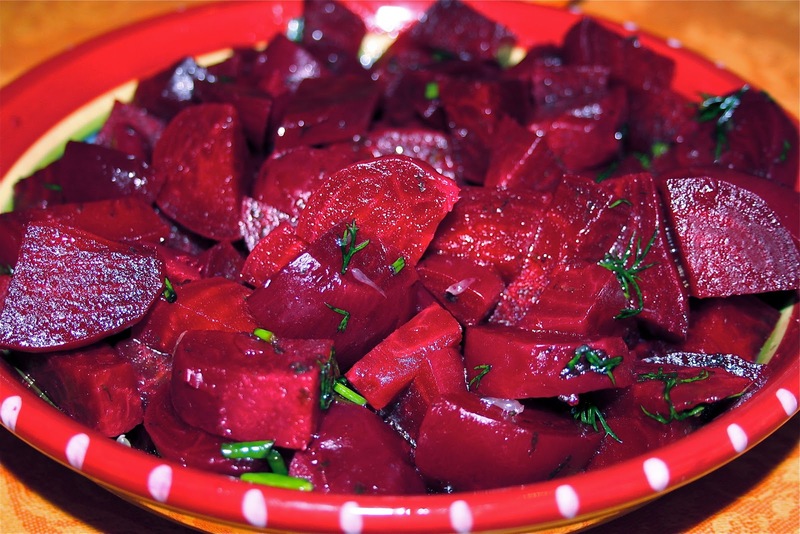 Although I roasted these myself, I usually buy and enjoy the pre-cooked beets. The minis at Trader Joes. The big guys at Whole Foods. They are in the process of building a Whole Foods near us... but I didn't realize that TJ carries the pre-cooked beets. Thanks for the tip. This really was a great way to serve beets! We really enjoyed the dressing! Lovely photo of your salad! We love beets at my house too. This is such a cheerful looking salad. I had extra dressing, but I think my bunch of beets might have been on the small side.